Every now and then some recipe comes across my facebook feed that I really want try. In this case, it was a post by The Artful Parent that talked about the soft pretzels that she made with her daughter. 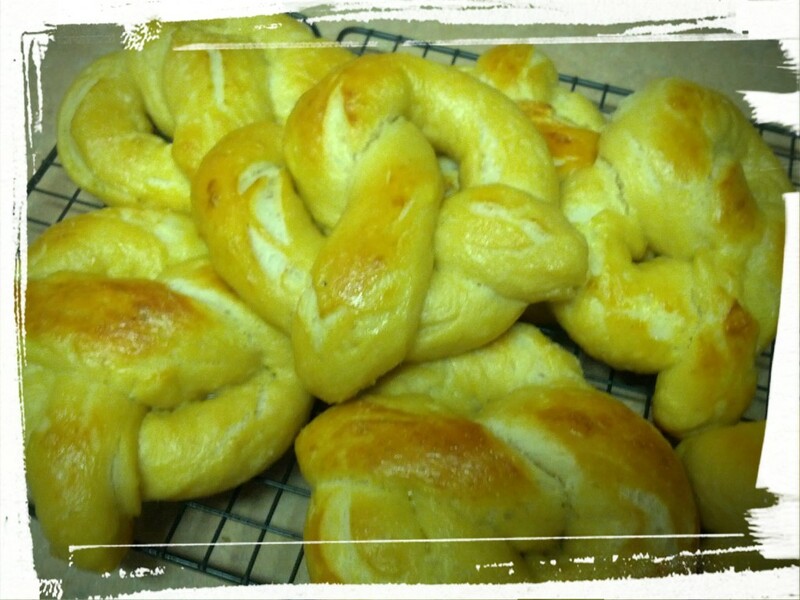 They used Alton Brown’s pretzel recipe and raved about it so much that I had to try it myself. So I did! I’m calling it a Memory of Meals Past post, as I’m posting it on a Thursday, and it’s not an original recipe from me, nor a bake-a-long recipe. Not strictly a Memory of Meals Past, given that I made it today, but…hey, it’s a Thursday, and I’m linking to a recipe as opposed to writing up a new one, so good enough! 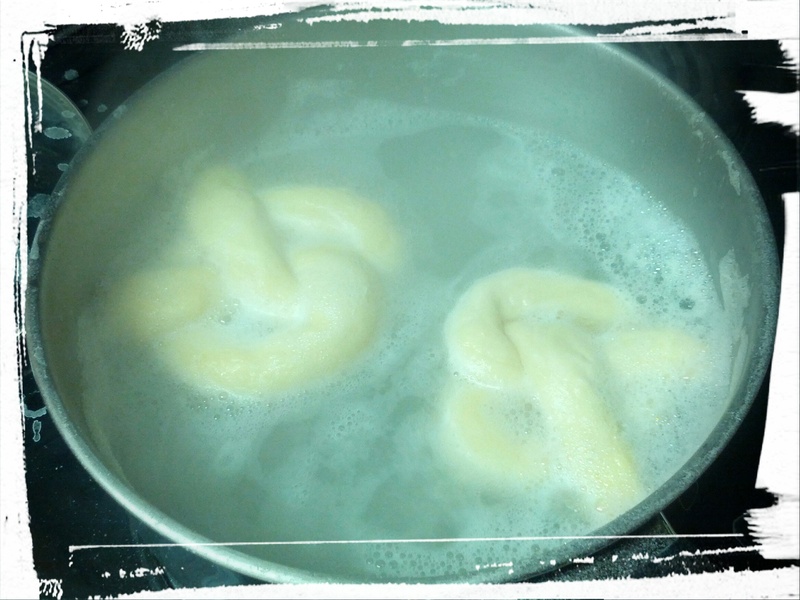 The traditional brown colour of the baked pretzel is achieved by doing a number of things: once the dough is made and you’ve twisted it into a pretzel shape, you boil the unbaked pretzels in a baking soda and water bath for half a minute. Then you place them on a baking sheet and brush them with an egg yolk and water mixture, then bake until they’ve achieved that deep golden brown colour. The baking soda and water bath sort of blanches the dough, if you will, so that when it bakes up, the outer (blanched) crust has to crack to let the dough expand. This creates those cracks in the deep brown texture that you often see in the professionally made pretzels. 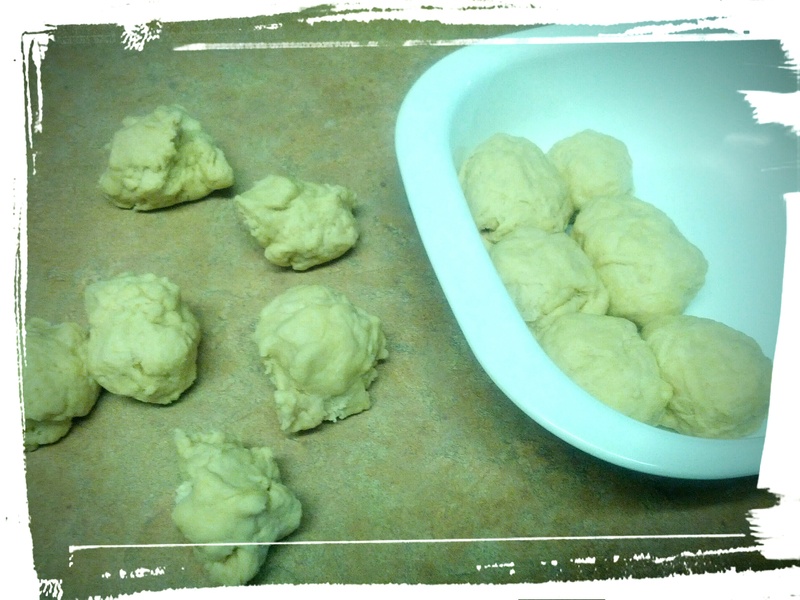 I had to add at least half a cup of water to the dough in order to get it to be as pliable as Alton says it should be. Also, the baking soda bath should have been longer that the recommended 30 seconds, in order to get those traditional and professional-style cracks that I mentioned above. Post boiling, and pre baking. 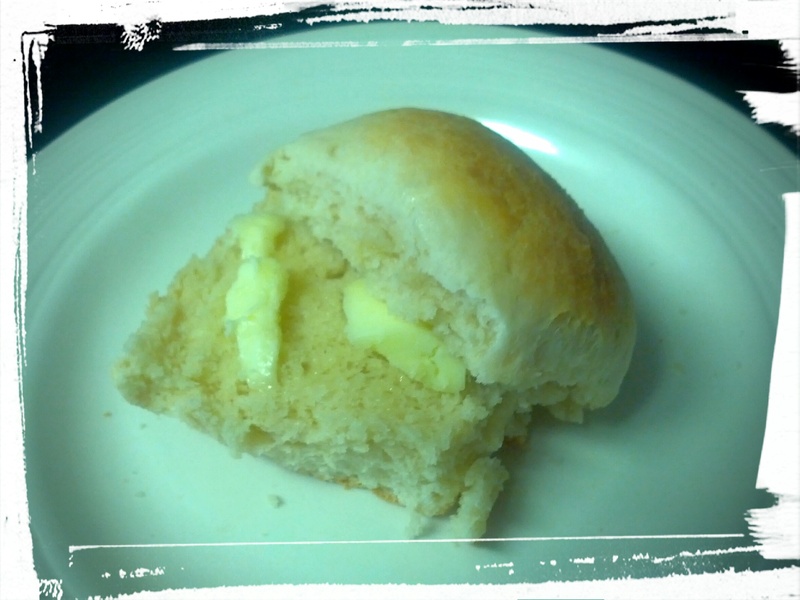 I admit it, I under-baked the dough by 2-4 minutes, according to Alton’s recipe. I generally under-bake, because I find most recipes call for a crustier whatever-it-is than I like. 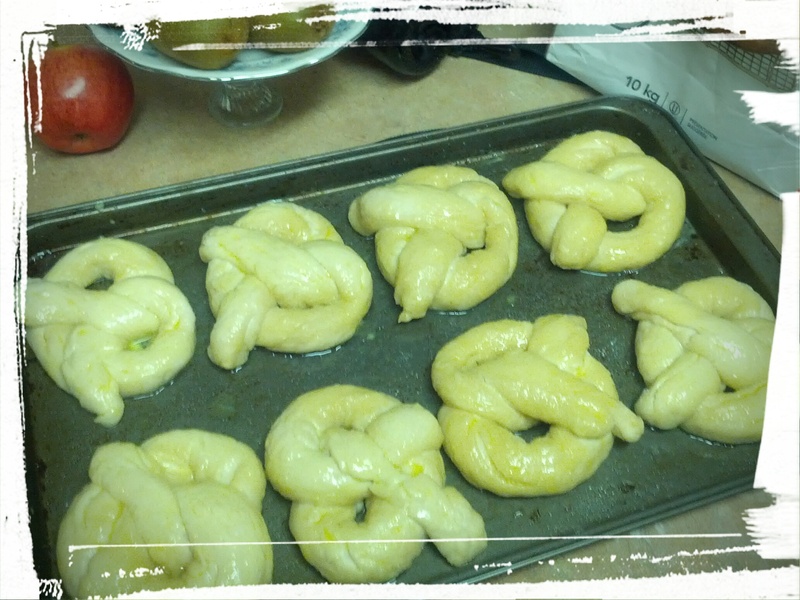 In this case, I probably should have at least baked the pretzels for 12 minutes as opposed to 10. Mea culpa! I’ll also use official pretzel salt. I only used standard size sea salt this time, and I think pretzel salt would definitely add a nice bit of texture. The recipe makes for an easy and tasty dough, but if you make it, I recommend making the changes I outlined above. Or don’t, and let me know whether it was just me! I’ve packed some for the DH and I for lunches tomorrow. Now to figure out some delicious dipping sauces! Hmm…any ideas? Next Post: Probably a salad post. Because IBS. This entry was posted in Uncategorized on July 31, 2015 by Margaret. I think the only unique thing about this post (besides the fact that the mango I saved for the recipe went bad and I had to replace most of it with the only other tropical fruit in my fruit bowl, kiwis), is that this post is a day late. Possibly even two days late, by the time I finish writing it up. I’ve mentioned before that I have IBS and I had another lovely episode at work yesterday, so I came home all trembly and weak, ignored the dishes on the counter that were looking at me reproachfully, and lay down on the sofa with a blanket, a pillow, and Netflix. I didn’t move until the wee hours of the morning when I flopped myself into bed. 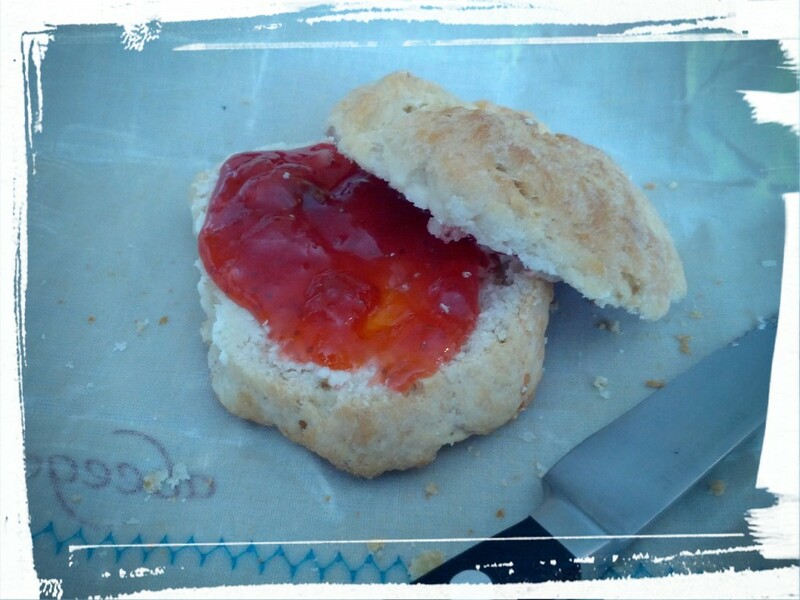 However…I persevered! Pain or no pain, I was going to make the pannacotta after work! Even if I couldn’t eat it myself. 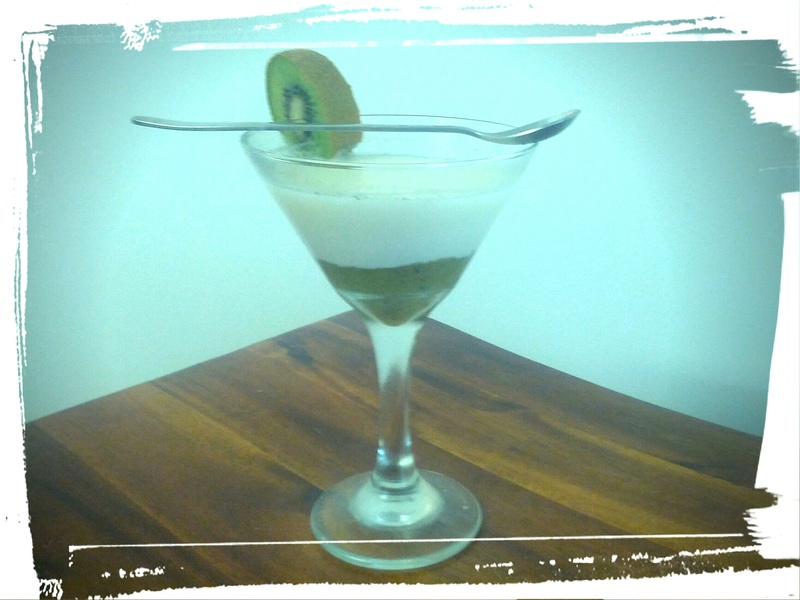 The pannacotta contains gelatin, and being a vegetarian, I gave eating this one a miss, and passed it on to the DH. I knew he would appreciate my sacrifice. My delicious, tasty, sacrifice. The recipe itself is pretty easy to make. 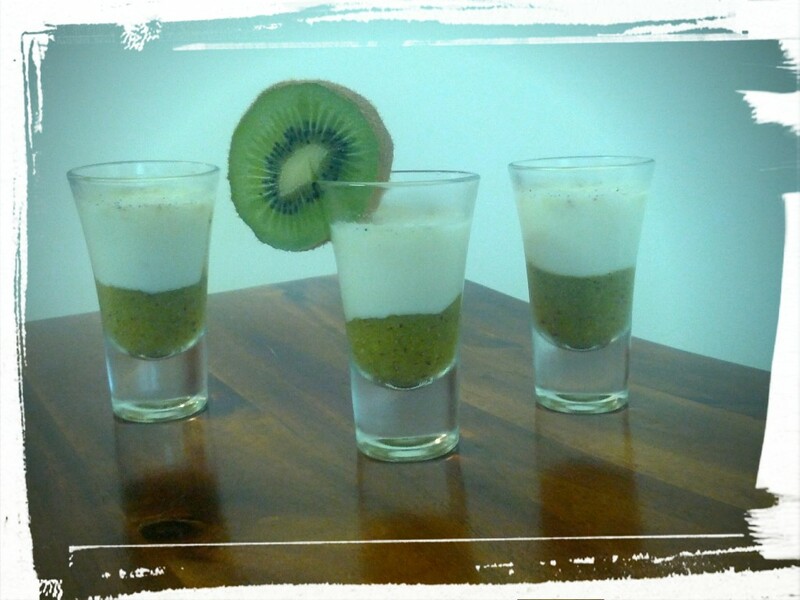 Just make the fruit puree and spoon it into some pretty glasses. Boil up the cream/milk with a vanilla bean, add in the gelatin, let cool, and pour over the chilled fruit puree. Let sit in the fridge until set. Serve! Easy, yes? Even with a stomachache I could manage it. The DH thoroughly enjoyed the pannacotta, and I will say, the puree itself was delish! I’d love to try making this recipe with some agar agar, or another vegetarian gelatin alternative. I wonder if any of the other bloggers did? Want to see what everyone else made? Check it out here! Next Post: Something that won’t make my stomach hurt. Maybe time for another Salads I Have Known and Loved post! This entry was posted in Uncategorized on July 29, 2015 by Margaret. Cut and plated and ready to be devoured! Last weekend, there was a bit of a heat wave in Toronto, and temperatures hit the 40’s (Celsius) with the humidex. When you stepped outside, you were hit with a wall of humid heat, and you progressively wilted the longer you were outside. I was running errands and luckily remembered to pack that old-fashioned thing, a handkerchief, with which I mopped my face until I could practically wring out the fabric. All of which is a preface my latest Memories of Meals Past post, which is Double Layer Ice Cream Brownie Bars! A/C is all well and good (and oh boy, it’s soooo good!) but sometimes you have to regulate your temperature from the inside out! Also, brownies. And ice cream. I’ve been seeing a lot of ice cream recipe posts on pinterest and twitter lately, and they inspired me to make my own dish! I started with a brownie based layer (this one, if I remember correctly, although I added in chopped walnuts), baked in a parchment paper lined springform pan. 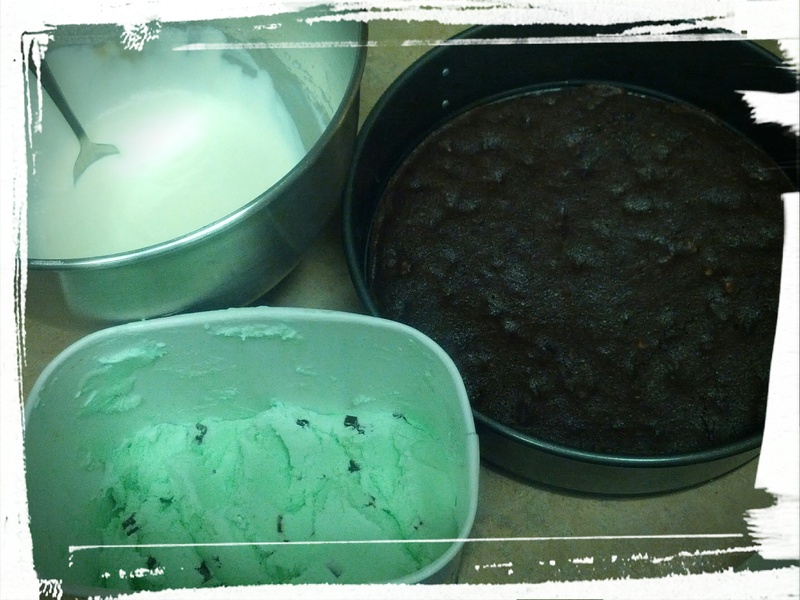 Once cooled, I spread a layer of softened mint chocolate chip ice cream on it and stuck it back in the freezer. While that was setting/refreezing, I mixed up a half-batch of homemade vanilla ice cream, using this recipe. I spread that over the top of the now set mint chocolate chip ice cream layer, and stuck it back in the freezer for several hours. And voila, Ice Cream Brownie Bars! What’s great about this recipe is that it’s SO flexible! Choose any ice cream flavour you like! I think the brownie base, with a strawberry ice cream layer, topped with the homemade vanilla ice cream, would be just fabulous — a Neopolitan ice cream bar! Mix up your own ice cream brownie bar (it’s SO easy!) and impress your friends, families, and those ever-important taste buds. Summer has arrived! Next Post: Parisian Pannacotta, or my Twisted Spinach & Feta Pie. Or maybe something else, depending on what I’m craving! This entry was posted in Uncategorized on July 23, 2015 by Margaret. It’s all about the French bake, baby! Also about the tart. 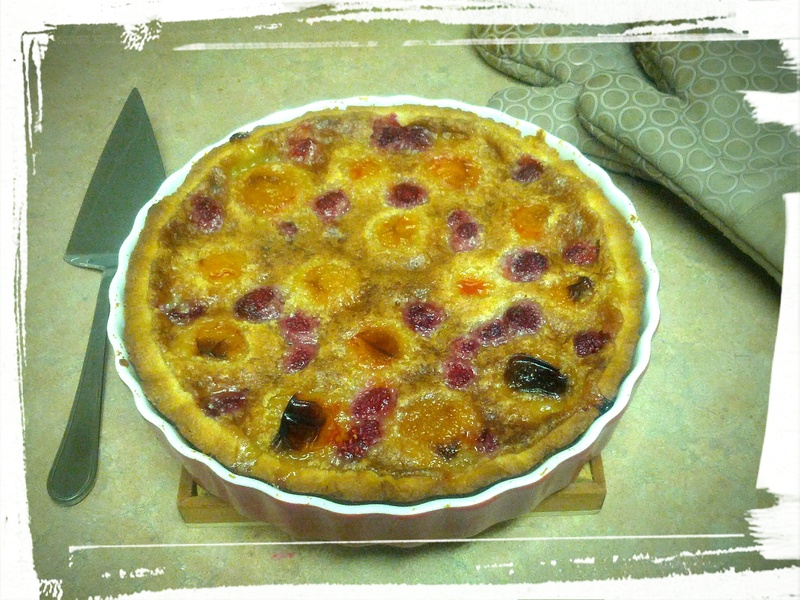 Mmm…tart! Blind bake that tart shell, sunshine! Came home, flopped on the bed and waited for the A/C to kick in. Reviewed Dorie’s recipe. Mixed up and blind-baked the sweet dough crust. Considered making a batch of ladyfingers to put in the base of the tart. Discarded that idea, because tired, and mixed up a batch of almond cream. Realized that I only had 1/2 c. of ground almonds. Tried to grind some walnuts in my spice grinder. Didn’t work. Ate the walnuts. Figured, what the hey, and only used 1/2 c. ground almonds in the almond cream. Add some vanilla extract to the almond cream. Decided I’d rather have a rum flavour, so added some rum. Wondered whether that would make it too runny, but again, what the hey. 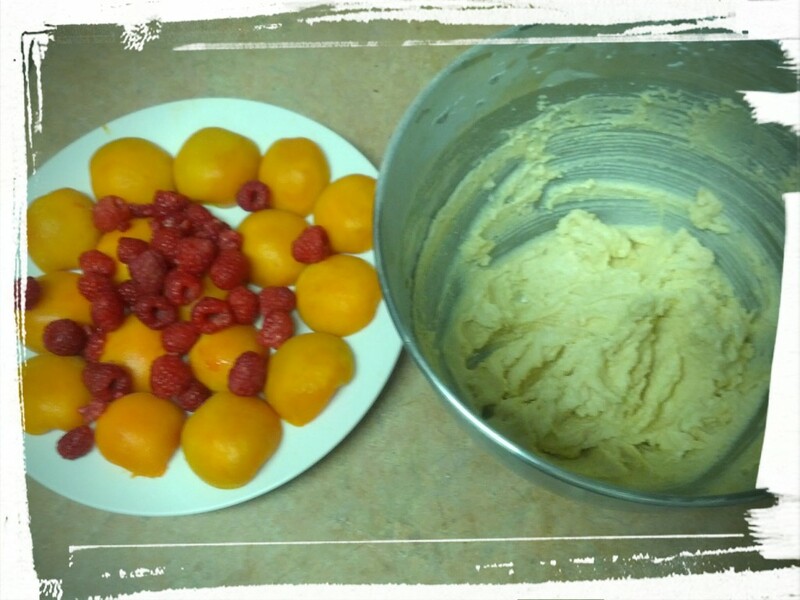 Add fresh fruits and almond cream. Taste testing is key. Spread the almond cream in the partially baked crust. 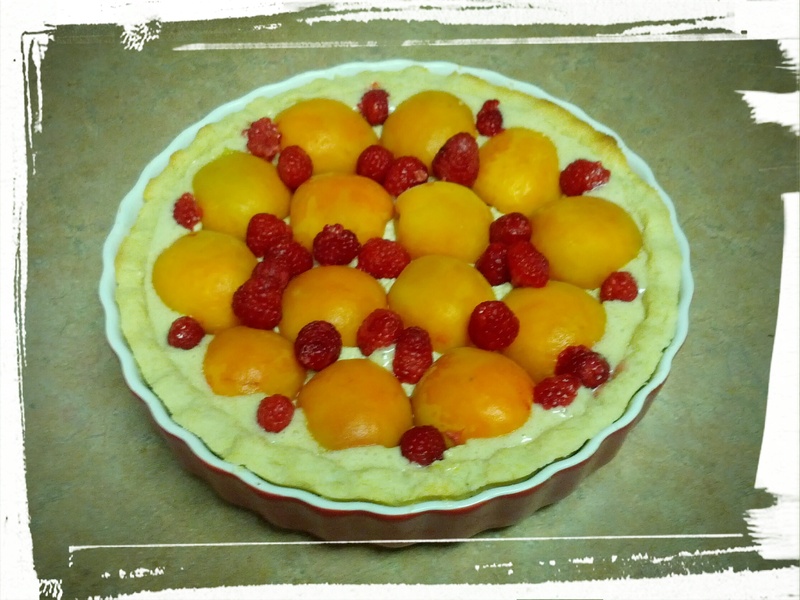 Topped with halved apricots and raspberries. Popped into oven. Peered into oven periodically to make sure crust and almond cream not burning. Worried that almond cream was awfully liquidy and baking only around the edges. Covered edges in tinfoil crown. Hovered around oven door some more. Removed tinfoil crown. Worried that entire tart too brown but almond cream still too liquidy. Put tin foil cover across entire tart. Hovered some more. Removed tin foil. Worried some more. Reassured self that Dorie is all about the “French bake”. Forced self to leave kitchen and logged onto computer. 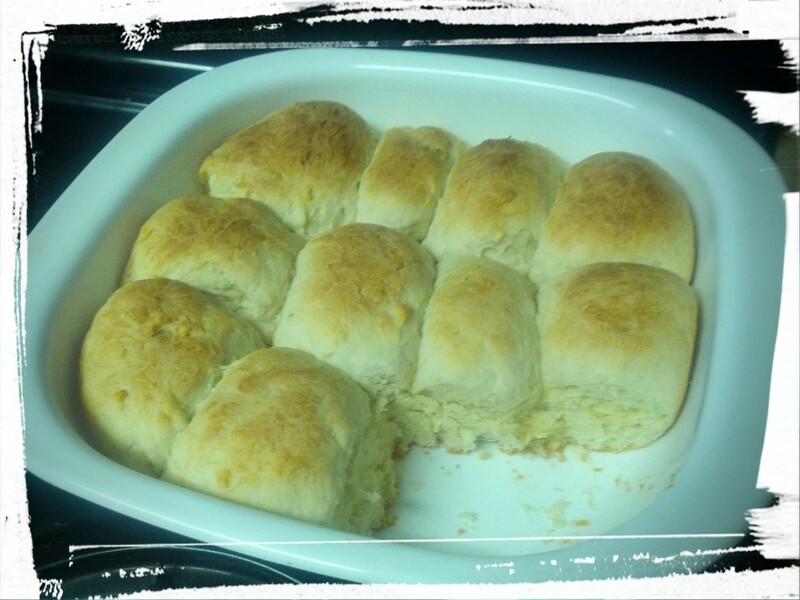 Checked out what other bake-a-long members did for their versions of the recipe. Noted different possibilities for future variations. Went back to kitchen. Checked on progress of tart. Made lunches for tomorrow. Checked on tart again. Did the dishes. Got dishpan hands. 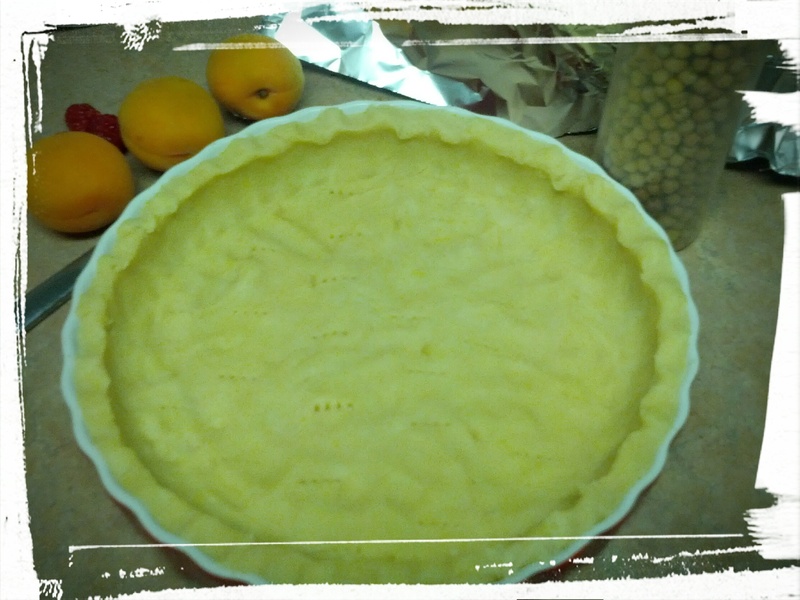 Took tart out of oven and let cool. Considered taking tart into work tomorrow for coworkers. Considered sending in tart with the DH to his work tomorrow. Discarded both ideas and promptly cut myself a slice. Enjoyed the tart. Ate another sliver. Packed a slice for lunch tomorrow. Wrote this blog post. Going to bed now. Sweet dreams, peeps! 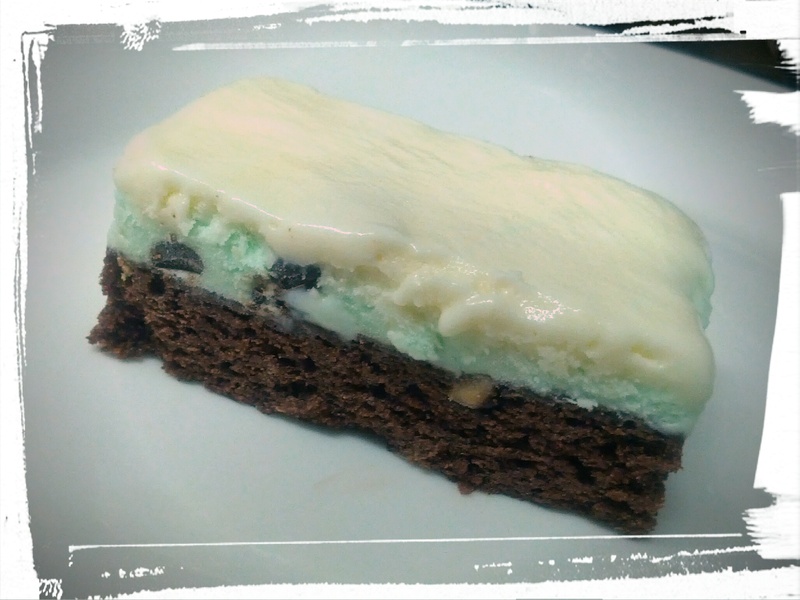 Next Post: Ice Cream Brownie Squares! Ice cream. And brownies. That is all. This entry was posted in Cook-a-Longs R Us on July 14, 2015 by Margaret.